After failing to take Carpiquet as their D-day objective, the 9th Brigade resumed their attack early on June 7th and at first advanced well, despite a few skirmishes, through Villons-les-Buissons and Buron, and reached Authie around midday. All of a sudden, the 2nd and 3rd Battalions of the 25th Regiment of Panzer Grenadiers of 12th SS Division attacked violently. The onslaught was terrible and the forward troops of the Canadian brigade were decimated or captured. The rear of the brigade managed to retreat , with the SS to their pursuit. Buron was taken back by the Germans and Villons just about to also be, when the Allied naval artillery opened fire on the SS attackers who were then forced back. The Canadian troops started to dig in around Villons and the frontline remained unchanged here until July 7th. 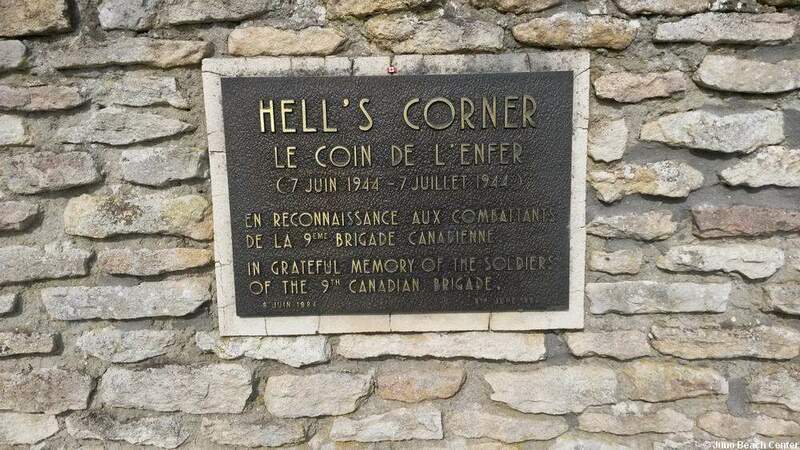 Nicknamed "Hell's Corner" by the Canadian soldiers because it was located where German shells continued to fall during one month, in order to prevent them from advancing.